Lobster lined up for dinner. If you are looking for a lobster entree which is filling and can feed a gang of people, lobster lasagna is a good option. For an easy lobster lasagna recipe, just mix a handful of cooked, cut up lobster meat with ricotta cheese and fold it into a basic lasagna recipe. I recommend making a ‘white’ lasagna – with a béchamel sauce and a variety of cheeses – vs. a tomato-based lasagna as cream sauces and cheeses will enhance the flavor of lobster. If you want to mix a vegetable into your lobster lasagna, I recommend some sweet, white corn. If you have more time and want to try a more adventurous lobster lasagna recipe, the below red, white and blue lobster lasagna recipe from Carol Bachofner, is excellent. It contains six different cheeses, including blue cheese and gouda, which helps create a rich, complex flavor. If you’re looking for a great lobster tail recipe, this one should work really well due to the intense flavors. My friend cooked this lobster lasagna recipe when I was back in Maine and below is her adaptation of the recipe. Happy cooking and eating! Note: Carol also uses a can of reduced fat evaporated milk in her lasagna to make it more saucy (I prefer my lobster lasagna without the extra sauce). Cook noodles until tender but not mushy, set aside. In skillet place celery, garlic, basil; cook celery and garlic til tender. Add cream cheese, blue cheese, and half and half. Stir. Gradually add white cheddar and gouda; stir until melted. Add wine and basil. Heat until basil wilts; remove from heat. Mix cottage cheese and egg. Layer in baking pan in this order: sauce, noodles, lobster, cottage cheese/egg mix, Derby cheese slices; repeat and end with remaining sauce and top with Derby. If you want your lasagna extra saucy, you may add evaporated milk to get to the consistency you desire. Top with 3/4 cup of melted butter, drizzled. Bake at 350˚for 35 minutes; let stand 10 minutes before serving. Note: All the cheeses could be shredded a day ahead and the lobster could be cooked and picked a day ahead. 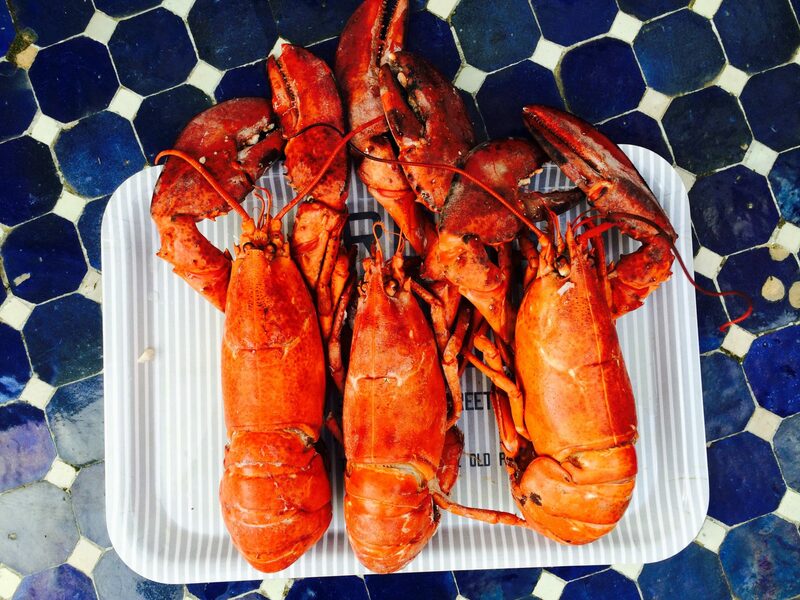 If you are looking for wine pairing recommendations with lobster, click here.